In a complete departure from the slick and smooth Bond movies we were growing to love, one rogue film rights package (sold far too cheaply by Ian Fleming), popped up to make it all look rather silly. In a complete departure from the glorious adventures, we have hallucinogenic comedic offering: Casino Royale. Peter Sellers, Ursula Andress, David Niven, Orson Welles, Woody Allen, Deborah Kerr, William Holden, John Huston, George Raft, Jean-Paul Belmondo, Jacqueline Bissett, Derek Nimmo, Ronnie Corbett, Bernard Cribbens, Geraldine Chaplin, Anjelica Huston, Burt Kwouk, John Le Mesurier, Stirling Moss, Caroline Munro, Peter O’Toole, among others. It is hard to recall a film that featured so much acting talent. And it all kicks off in fine style with David Niven, one of Fleming’s original potential 007s, appearing as a retired, and stuttering, Sir James Bond, calling out the CIA’s Branson with his trick carnation that spits out cyanide. Le Grande apparently had different deadly poisons in his fly buttons. Not to be outdone, M had a few flame throwing fountain pens to be going on with. Sir James clearly wasn’t enraptured with the work of Q Branch or the tawdry fashion in which the spy game had developed since his retirement, “You are joke shop spies, gentlemen”. 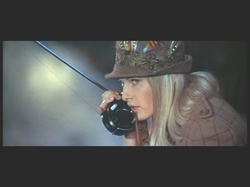 The pretty Smersh operative, who was enjoying her nice day fly fishing, was then featured talking through a walkie talkie cunningly disguised as a fishing rod – why she didn’t just have a walkie talkie is anyone’s guess. And the subject of her communication? A McTarry Castle guard, on his walkie talkie bagpipes. Yes, bagpipes. There are entry level Walkie Talkies and professional Walkie Talkies. We have completed our research and consider these to be among the better deals for each end of the spectrum. Below are the direct links.